The global functional food ingredients market is consolidated in nature with a few players operating in it across the globe, stated a new market research study by Transparency Market Research. The leading players in the market, such as Cargill, Inc., Associated British Foods PLC, and BASF SE are anticipated to collectively hold a large share of the overall market throughout the forecast period. In order to sustain in the fierce competition and enhance their market penetration, the key players are focusing on advertising and marketing activities. In addition to this, innovations and developments in this field is estimated to encourage the growth of the global functional food ingredients market in the next few years. Furthermore, the rising number of mergers and acquisitions and strategic partnerships are anticipated to generate promising growth opportunities for the market players throughout the forecast period. According to the market research study by Transparency Market Research, in 2016, the global market for functional food ingredients was worth US$20.35 bn and is likely to reach a value of US$32.40 bn by the end of 2024. As per the report, the market is predicted to register a healthy 6.0% CAGR between 2016 and 2024. 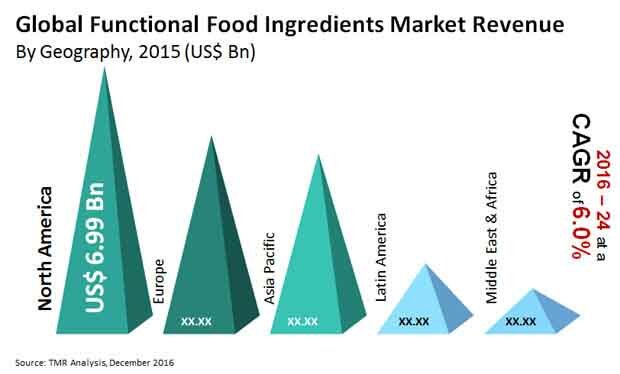 In the last few years, North America led the global functional food ingredients market by holding a large share of the market. The rising demand for functional food ingredients, owing to the rising number of restaurants is projected to encourage the growth of the North America market in the next few years. Furthermore, Latin America and Asia Pacific are estimated to witness a healthy growth in the next few years. The increasing contribution from Brazil, India, and China is estimated to enhance the growth of these regions in the next few years. In addition to this, the rising disposable income of consumers and the increasing working class populations are some of the other key factors, which are predicted to accelerate the growth of Asia Pacific and Latin America throughout the forecast period. On the basis of ingredients, the global market for functional food ingredients has been categorized into carotenoids, essential oils, vitamins, minerals, probiotics, omega 3 and 6 fatty acids, prebiotics and dietary fibre, hydrocolloids, soy protein, and proteins and amino acids. The rising demand for functional foods and beverages across the globe is anticipated to enhance the growth of the overall market in the next few years. In addition, the rising awareness among consumers regarding the benefits is likely to enhance the growth of the market in the near future. The increasing cases of chronic cases and the rising health awareness among consumers concerning the benefits of making use of functional food ingredients are some of the key factors that are projected to enhance the growth of the market in the next few years. In addition to this, the growing demand for fortified beverages and food products is another major factor, which is estimated to accelerate the growth of the market in the near future. On the flip side, the vulnerability to the seasonal changes and the rules and regulations for food safety are projected to restrict the growth of the global functional food ingredients market throughout the forecast period. Nonetheless, the rising opportunities in developing economies are projected to encourage the growth of the overall market throughout the forecast period. North America to register a healthy growth rate and lead the global functional food ingredients market in the next few years. Key players in the market to focus on developing economies, which is likely to offer potential growth opportunities in the next few years.